I first played this game last June on my laptop and last Monday I decided to revisit the game on my desktop. 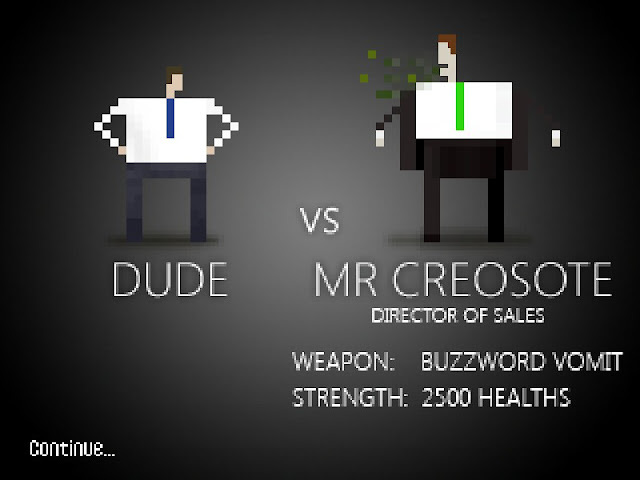 Level 8 is a boss fight against the director of sales, Mr. Creosote. His weapon is "Buzzword Vomit."Ha! The experience was better with a mouse and the game was full of laughs. I ended up playing for more than an hour! More precisely, I played for 75 minutes which was more than five times as long as I played the first time around. Want more of my thoughts and/or comments on Corporate Lifestyle Simulator?